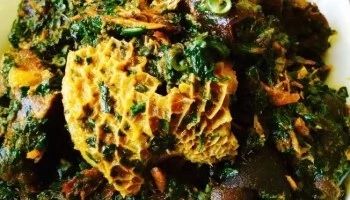 Egusi soup with okazi is preferred by some people than egusi with some other vegetables, this is because okazi is a highly medicinal leaf that is rich in fibre which is also good for the digestive system of our body. 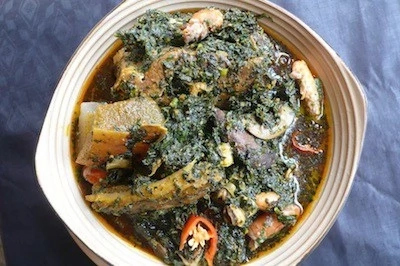 Okazi is a traditional Nigerian soup made from the forest plant called centum Africanum, popularly known as Okazi by the Igbo people. 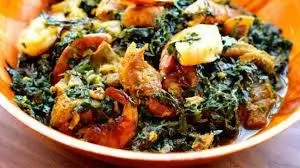 The Igbo’s cherish okazi so much mainly because of its medicinal value which is very good for the human digestive system, it is used to prepare alot of recipes like okazi soup, okazi yam pottage, etc. Pepper is yet another useful ingredient in preparing egusi soup, it gives it that peppery taste, and makes the soup sharper in taste. Fresh pepper is most suitable for the cooking of egusi soup, though other species can still be used depending on the way you want it. Pepper comes in different varieties, like the red pepper which is commonly seen around and most available and cheaper to buy in the market, we also have the yellow pepper or rather called the Nsukka pepper because it is mainly cultivated in Nsukka area of Enugu State, we also have the one they call green pepper, which is used in cooking fried rice, jollof rice, party rice, or preparing some snacks like shawamma, etc. We have the one they call dry pepper, which is reddish in colour and mainly used as ground pepper when ground. There is also the tatashe, which is another specie of pepper that is used to cook certain delicacies. Just like you find in other dishes, onions is vital in cooking egusi soup, it makes the soup or it gives the soup that sassy taste. Onions can be put more than one times in the course of cooking the egusi soup. It can be put intermittently as the cookinggoes on. Without it, egusi soup may not be that enjoyable to the mouth because it will not be that tasty as you expect it to be, despite the presence of these other ingredients. Onions comes in different types; we have the white onions and the red onions. Each of them has its unique flavor it adds to any dish you may apply them to. The white onions is mainly used in preparing such dishes such as fried rice, jollof rice, different types of stews including beef stew, etc, while the red ones are used mainly in preparing different types of soups. Palm oil is another ingredient here, it forms the base of the soup on which the other ingredients are added to. Palm oil is very nutritious as it contains plenty of vitamin A.
Palm oil can be locally extracted from its nut and used directly in cooking any dish, by pouring the raw palm nuts in a clean pot and you then add a little water and place on the fire, and allow it to boil for like 30 minutes or until you start seeing the red oil settling on the surface of the water. Then you put it off the fire and use your hand to squeeze out the oil from the palm nuts while it is still hot or at least warm enough to allow you dip your hands to squeeze out the oil from the palm nut. After squeezing out the oil from the palm nuts , you then remove or sieve out the residues,which is mainly comprised of palm fibres. Once this is done then you pour out the oil and apply it directly to your dish. It is said that this method or this type of palm oil processed in this manner add more delicious flavor to your dish more than he ones chemically produced and as well those produced by machine. These two ingredients, fresh tomatoes and tin tomatoes are very important in cooking egusi soup. Both two ingredients are required in cooking egusi soup. The fresh tomatoes gives the egusi soup that fresh fruity taste of tomatoes, while the tin one reddens the egusi soup or serves as a colorant to the outward appearance of the egusi soup. Tomatoes generally are very rich in vitamin A, plus some other vitamins attached to it. Tomatoes can be taken as fruit or used in cooking of stew or certain soups like the egusi soup which makes use of diced tomatoes in its preparation. When applying tomatoes to your dish except in preparation of snacks, tomatoes, whether fresh or tin should be fried a little to remove that citric taste or sour taste as some may call it, for to properly blend with the rest of the ingredients used in cooking the food, otherwise the tomatoes may not completely blend with the rest of your ingredients. Snails serve as part of the assorted meats that accompany the preparation of egusi soup. It is an integral part of the soup which makes the soup more palatable. Snails generally are tasty source of protein, though one should be mindful of the manner of processing it or them because snails are dirty in nature and they like dirty things just like we find in pigs. So when processing them should be careful and use lime to thoroughly wash them so that there will not be any risk of getting ones through the consumption of them. There are different types of snails available in the market today, they are the small sized brownish types and the big sized reddish ones. The reddish ones are very big in size and are more expensive in the market. They are easier to process than the smaller ones. 2. Clean the stockfish and boil in another pot with onions till soft. 3. Add the snails to it and allow it to boil for 30minutes. 4. Add onions, pepper, seasoning and ground melon, as well as ground crayfish to the heated oil, and allow steaming for one minute. 6. Add the washed and cut okazi leaves, salt to taste and allow it to simmer for 5 minutes.